GSO's hybrid 0.965"-1.25" 90-degree diagonal features an image erecting Amici glass prism that allows you to look into a telescope at a 90 degree angle. It produces an image that is oriented properly, which means that the image is upright and correct from left to right (i.e., a correct, non-inverted, non-reversed image). This is a great diagonal for daytime terrestrial use with small telescopes or spotting scopes. It can also be used for nighttime astronomy applications, especially when you would like to match the orientation of the star field with "correct" star maps and charts. 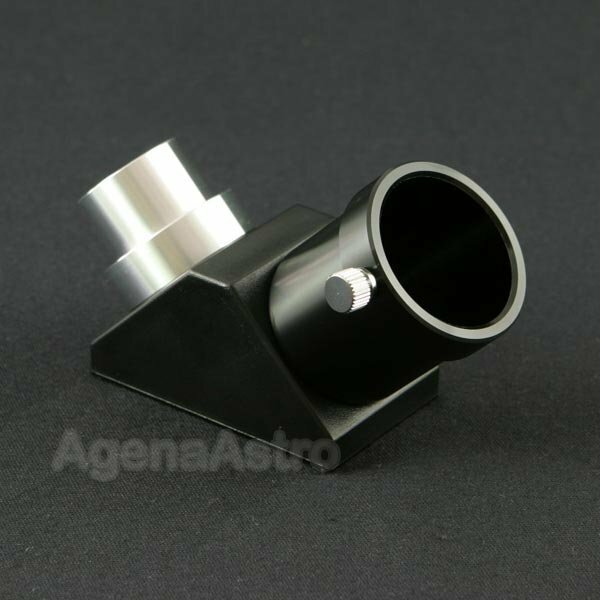 The prism housing is made of high grade ABS plastic and the end barrels are made from precision machined aluminum. Weight: 3.7oz; 2 end caps included. Made in Taiwan. 4.0 (Based on 6 Reviews) 67% of reviewers recommended this product. Review by Thom of Minerva, OH. 4.0 I like the product, would buy again. I use this with a 90 mm spotting scope with excellent results. Review by craterdavy of Maine. The optics seem good.,,but the .965 barrel is short.,,and a little to skinny.,,not a good fit. Review by worcspaul of Worcestershire UK. I bought this to use with an old 60mm refractor which has 0.965" fittings. The diagonal is well made with a good, strong 0.965" nosepiece. However, I am unable to reach focus as the thick "collar" at the base of the 0.965" section causes an attached 1.25" eyepiece or webcam to be too far back - even with focus wound right in. I'm sure a reduction of the collar to a 1-2mm thickness would be sufficient to correct this. Review by Telescope Tim of East Coast USA. I use this diagonal in a 1960's 3" F16 refractor. It's nice to be able to use 1.25" eyepieces in the old scope without additional adapters. The more adapters you have, the greater the chance of misalignment from eyepiece to objective. This is a superior remedy. One issue that I did find was that the mirror was not collimated well from the factory. I found it to be significantly off. In my F16, this may not be much of a big deal, but I collimated it anyway by loosening the four screws on the outside of the backplate and inserting folded pieces of foil between the plate and housing. I then tightened the screws appropriately until I was well collimated. I find the surface to be well polished / accurate. No problems viewing fine planetary detail and splitting tight double stars. Izar looks nicer in this diagonal than it does in my OEM prism. I also have a slightly better view of Cassini's division with this diagonal than the OEM prism. Also, the aluminum coating is just fine. Contrast is not quite up to the level of my prism diagonal, but it's very good and does not introduce false color like a prism diagonal may. Light scatter is decently controlled as well. I did compare this with an older Televue mirror diagonal I have (the one that came with the old TV Ranger) and would say they are on par with each other after you collimate the GSO. All in all....for the price (and if you can collimate)...I'd recommend. Review by John V. of Oshawa, Canada. Put's life back into old telescope.